Whole30 – Day 17: No more eggs! Today I woke up and was starving and wanted to scoff like a whole bowl of muesli with yogurt and milk… I didn’t. I ate a banana and made some scrambled eggs, and left the house not feeling very satisfied and definitely feeling over eggs. Need to look up some recipes for smoothies so I can have a break from eggs for a bit. At work I was really craving carbs/sugar and wanted to go get a large latte and a muffin. So annoying as I thought I was over the cravings part! It really did take a lot of effort not to go carb crazy. I basically just thought of how bad I would feel if I ate a whole heap of grains and dairy after coming so far on my Whole30 challenge. I really want to finish the 30 days as true to paleo as possible. Lunch was leftover macadamia crusted fish and coleslaw with green tea. I was out for Vietnamese at a local ‘el cheapo’ restaurant this evening. 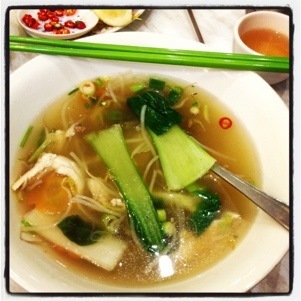 Chose a chicken pho with veg instead of noodles, which was nice and filling. My friend was suspicious of MSG though – definitely not 100% Paleo, but I tried! Next Post Whole30 – Day 18 & 19: Celebration time! have your leftovers for breakfast! If you can find some compliant salami (try the deli counter?) I like to have that with chopped raw veggies for breakfast. It takes minutes to prepare and is really satisfying!